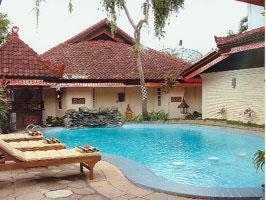 Graha Resort Ubud & Spa, Bali discount hotels and accommodation. Graha Resort is centrally located in this village of artists, around 5 minutes walk to Ubud monkey forest and 10 minutes walk to Ubud art market. The hotel is designed to meet your real experience of Balinese cultural and is surrounded by lush tropical garden which gives a fresh and cool atmosphere.Our well-maintained hotel and regular refurbishment will convince you the most un-forgettable stay while in Bali.Spend your holiday with us and experience the Balinese style services. This is your home in Bali and can not be found anywhere else. View photos, room descriptions and make online reservations at Graha Resort Ubud & Spa. Save on room prices at Graha Resort Ubud & Spa, Bali.